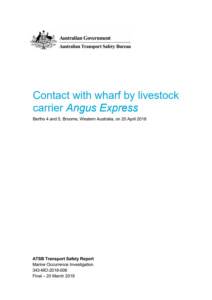 ATSB published its report on the contact with a wharf by the livestock carrier Angus Express. The vessel contacted Berths 4 and 5, at Broome, Western Australia, on 20 April 2018. 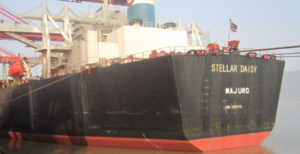 The report concluded that the harbour master and pilot were not aware of any height of tide limitations regarding berthing ships alongside Yokohama fenders at these berths. On 20 April 2018, the 103 m livestock carrier Angus Express arrived at the Broome, Western Australia, pilot boarding ground. The ship had just completed a voyage from Singapore, and was expected to load cattle at berths 4 and 5. 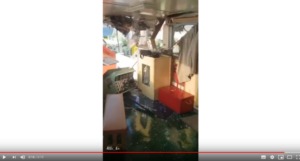 When booking the pilotage on 16 April 2018, the master had advised that the ship’s bow thruster was inoperable. The port’s handbook suggested that a ship of Angus Express’s length with no thruster should use two tugs for arrival and departure. The tugs were booked in advance, but on 19 April, the pilot became aware that only one of the port’s two tugs would be available. He then informed the harbour master who advised that there were no strong winds and the ship berthed within an hour or less of slack water, the pilot could make the decision whether to continue with the berthing. The pilot then carried out a risk assessment and discussed it with the harbour master. 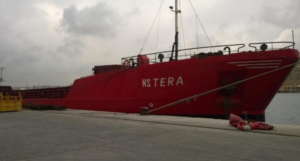 They decided that the ship could berth with the use of only one tug. The pilot explained the plan to the ship’s chief mate and master during the MPX and they agreed with the plan. The pilotage into Broome continued with a tug in attendance, and went as planned and without incident. The pilot swung the ship to port and approached the wharf, to berth starboard side alongside. A little later, the ship was alongside the wharf, with two Yokohama fenders located positioned forward and aft, between the ship and wharf’s vertical fender posts. The ship was about 8 m aft of its berthing position at berth 4 and 5, when mooring lines were run to the wharf. The pilot then attempted to use the mooring winches to heave in the mooring lines to move the ship forward into position. 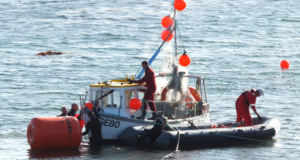 However, by then, the slack tide was beginning to change and the pilot estimated there was a current working against the bow and the mooring winches were ineffective. The pilot then instructed the tug, in position about amidships, to push forwards at a 45° angle using minimum power, to help reposition the ship. Moments later, the weight of the ship against the forward Yokohama fender forced it to pass under the fender posts, which caused the ship's bow to move towards the wharf. Shortly afterwards, an overhanging scupper protrusion contacted the fender post. The pilot thought that the ship had pivoted on the Yokohama fender and instructed the tug to stop pushing. The ship moved slightly off the fender posts and the fender cleared the post. At 07.14, the pilot instructed the tug to push minimum forward again, resulting in the forward Yokohama fender once again passing underneath the fender posts. The ship's bow again moved towards the wharf, and the scupper protrusion again contacted the fender post. The pilot instructed the tug to stop, and the ship came away from the vertical fender posts. The pilot then advised the master to use the ship’s engines to reposition the ship. A little later, the vessel was in position as intended and all fast with the height of tide now at 1.65 m.
The pilot reported the incident to the harbour master who attended the ship and found minor damage to the ship's superstructure. The height of tide at the time of the incident was 1.62 m, which was low enough to expose the base of the fender posts. When the pilot tried to manoeuvre Angus Express forward using the tug, the force exerted on the Yokohama fender by the ship, allowed it squash and roll under the fender post. As a result, the ship moved nearer to the wharf and the scupper protrusion contacted the post. In addition, the reason for changing Angus Express's berthing plan was a possible 1-week delay because of tug unavailability. This delay could have led to stranding a large number of cattle in holding yards for a long period with only about 8 hours of loading fodder available. Thus, the reason to change the berthing plan were valid. However, at that time, neither the pilot nor the management of both WCP and KPA knew about the shorter fender posts at berths 4 and 5, and the potential for Yokohama fenders to be forced under them. If this information was known and effectively communicated, it would have been considered during the risk assessment and the incident could have been avoided. 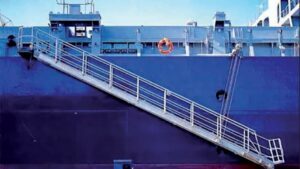 Kimberley Ports Authority: Kimberley Ports Authority advised the ATSB that it implemented guidelines for berthing and being alongside when using Yokohama style fenders for times of limiting low water levels. Moreover, the risk evaluation process between harbour master and pilot has been extended to contain quick risk assessment for circumstances like tug shortages, ship manoeuvring issues and tidal levels. A memorandum has also been issued to all pilots and port users advising of these changes.